It’s the little things that often remind me of how quickly the girls are growing up. The most recent examples of this phenomenon occurred with Sophie over the holiday break, and involve a new desk and a solar system. Who’d have guessed that these two random things – a surface on which to write and a bunch of painted spheres – would make me feel incredibly happy to be Sophie’s mom, yet bittersweet about the little girl in her ceding space to the big girl increasingly asserting her individuality? Until a week ago our dining room table served as Sophie’s desk. 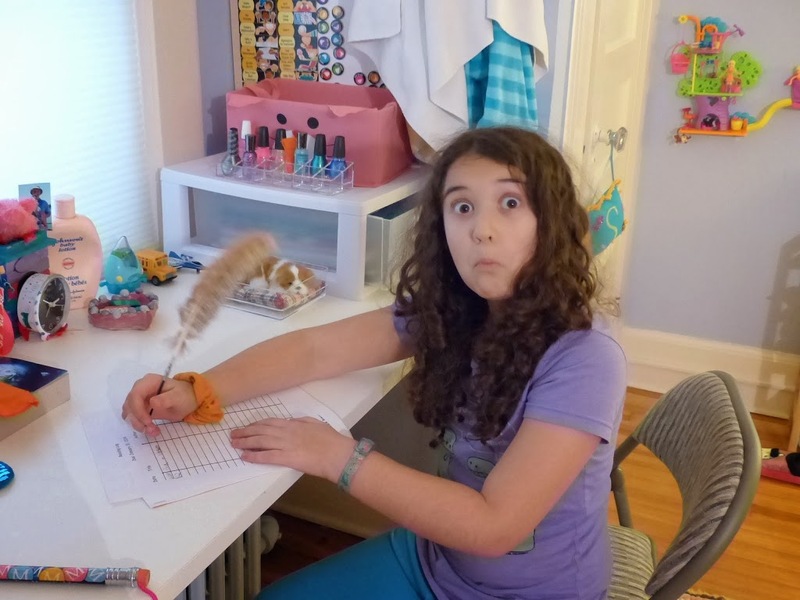 She’d been hounding us – not unreasonably so, mind you – since the end of 2nd grade for a “real” desk in her bedroom. We put it off for several months for no good reason, except that adding a desk required moving furniture around in her bedroom, a job that demanded a couple of days of commitment and attention, and several large garbage bags. Those days finally arrived after Papa had the brilliant idea to put an old table in the attic to good use, and Sophie is now a proud member of the big kid ranks. Of course, a desk isn’t very useful without the proper supplies, so we took her shopping for the right accoutrements, which she then proceeded to organize with an attention to detail and jubilance that befit an 8-year old girl who still remains easy to please despite approaching those dreaded “tween” years. Sophie has a lot of tricks up her sleeve. And I confess that I am sometimes guilty of underestimating her talents. 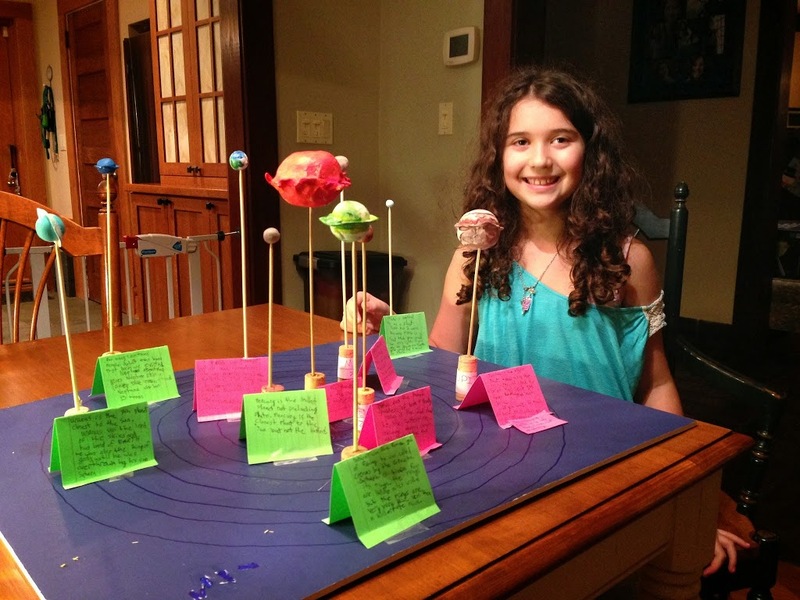 Below is a photo of the amazing solar system Sophie made last week for a school project. She constructed it from scratch, all by herself, using Model Magic and paint, and corks and skewers to hold the planets, the sun and Pluto in their proper orbits. When she brought it into school the other day, she realized that most kids in her class had used store-bought kits. She was appalled. I was sort of appalled, too (but mostly because we didn’t think of that idea ourselves). Unlike Chloe, Sophie is the type of kid who doesn’t let the perfect be the enemy of the good. Her sense of creativity differs from Chloe’s in that Sophie embraces imperfection. This attitude is liberating because it enables Sophie to have more fun with projects like these. Don’t get me wrong – she complained plenty when she was working on it. But she more easily overcame her frustrations to turn back to the job at hand and accomplish something of which she was rightfully very proud. All of this is to say that moments like these – outfitting a new desk in a newly reorganized bedroom, or creating a super cool model solar system – make parenting worth its weight in gold. Because at the end of the day, despite the heartaches, disagreements and struggles, nothing beats witnessing your child come into her own.